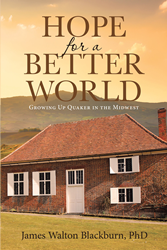 “Hope for a Better World: Growing Up Quaker in the Midwest” from Christian Faith Publishing author James Walton Blackburn, PhD, is an amazing and immersive work that lays out the Quaker principles and its founding values and historical personages. “Hope for a Better World: Growing Up Quaker in the Midwest”: a compelling glimpse into the Quaker way, is the creation of published author James Walton Blackburn PhD, a born and raised member of the Religious Society of Friends (Quakers). He holds a master’s degree in city planning and a PhD in public administration, working for the Illinois Department of Human Services. He is retired with his wife in Omaha, Nebraska. Blackburn writes, “This book tells the story of how I grew up in a Wilburite Quaker family in Ohio and attended Scattergood Friends School in Iowa. I give an overview of Quakers who originated as the Religious Society of Friends in seventeenth-century England. I tell about Wilburite Friends, which are much different from most Quakers. Their practices are close to early English Friends. I tell how the Blackburn Family lived out Quaker beliefs. I tell about Scattergood Friends School in Iowa. I present my personal faith. Published by Christian Faith Publishing, James Walton Blackburn PhD’s new book is an engaging and comprehensive guide, part memoir and part values primer, focused on the core principles and beliefs that shape the Quaker community, one that may just end up changing society at large. View a synopsis of “Hope for a Better World: Growing Up Quaker in the Midwest” on YouTube. Consumers can purchase “Hope for a Better World: Growing Up Quaker in the Midwest” at traditional brick & mortar bookstores, or online at Amazon.com, Apple iTunes store, or Barnes and Noble. For additional information or inquiries about “Hope for a Better World: Growing Up Quaker in the Midwest”, contact the Christian Faith Publishing media department at 866-554-0919.